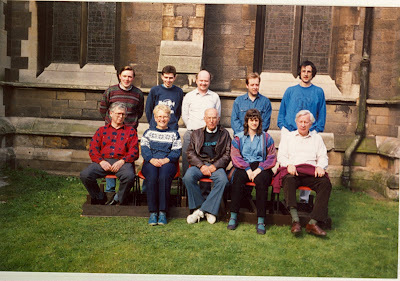 On Saturday 8th April 1995 The Midland Counties Guild hosted once again the now well­ established Worthington Cup Striking Competition for ten bell ringing. The venue as usual was St. Paul’s, Burton-upon-Trent. There were six bands competing and all must have been pleased that it was such a fine day on which to hold the event. The test piece was a full course of Cambridge Surprise Royal, following the tradition of alternating between Caters and Royal. The bells are never easy to ring well, being something to do with the sound inside the ringing chamber or the size of the ringing circle or some other suitable excuse, but even so, the afternoon sported some very creditable ringing. Unfortunately neither the president Mrs. V. Worthington nor the vicar Rev. David Morris were able to attend this year. We were pleased, however, to have the Churchwarden to make the draw promptly at 1.45pm. We were honoured to have as chief judge Alan Ainsworth whose abilities and discernment in good striking are second to none. He was made comfortable in the usual room directly opposite the tower, having an excellent auditory “view” of the ringing. Alan was assisted by Marion, his wife. Whilst the teams showed what they could do there were three local towers open for general ringing in the afternoon; Newchurch (6), Hoar Cross (6) and Hanbury on the Hill (8). This last tower is of special interest because of the underground explosions that occurred there some 50 years ago and which recently featured in a front page The Ringing World article. Gordon Lane enlightened the gathering at the draw with some details of the events, which added to the interest for those visiting for the general ringing. At 5.15pm ringers reassembled in the Church Hall (at the rear of the Church) to hear the verdict. With the Chairman of the Guild, Malcolm Quimby acting as MC, Alan Ainsworth delivered the result as follows (comments summarised). Confident ringing. best leads 4, 5, 6 and 7. Despite a bad trip in last lead they won by a clear margin. Best leads 2, 3 and 9. Rhythm slipped in middle. 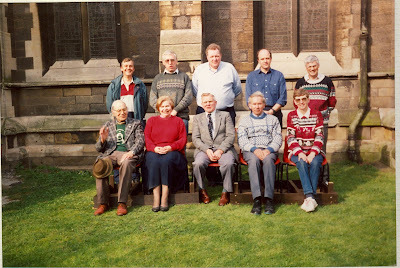 At 3hr 37m peal speed they were slower than other bands (c.3hr 23m) but it was good to listen to ringing at this pace. Bells jumbled in leads 5 and 6. Started at fast pace but tended to fall over themselves. Some rolls ups in the middle were good. Since Lichfield met one short, and “recruited” on the spot their effort was a valiant one and they are to be thanked for remaining in the field. 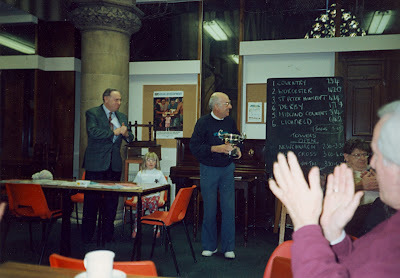 The conductor of the winning team, Gordon Halls, received the trophy, saying that it was becoming a habit for Derby to win it every other year. He threw down the gauntlet to other teams for future years. Thanks go to all those who participated, to the judge Alan Ainsworth and to all those who helped in the arrangements for the day. As Alan remarked to me, the bells are very, very pleasant to listen to outside the tower and do justice to the magnificent Church with its fine victorian interior. One endearing feature of the competition is that we have photographs of all the bands who have competed over the years with very few gaps, if any. These are kept in an album which is usually produced on the day, much to the amusement (!) 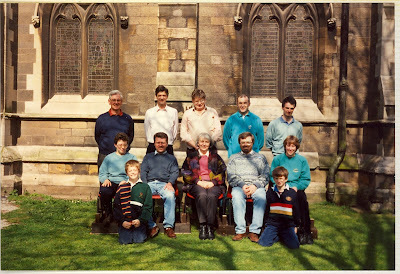 of many ringers who had perhaps forgotten what they used to look like 18 years or so ago. Although the album was not there this year it is our intention to put it on display next year, 30th March 1996, at the 19th competition. 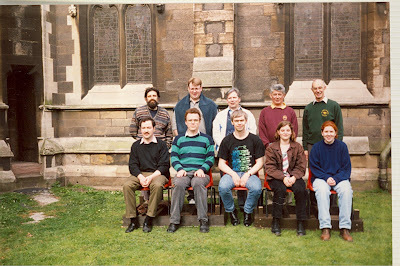 Jane Rogers , Geoffrey W Randall, Ruth M Border, James Hughes, Christine F Homer, Geoffrey Pratt, Simon P Rogers, Peter Border, Mark W Sayers, Paul McNutt. 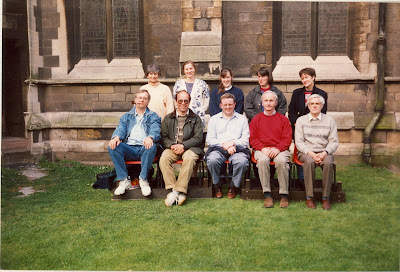 Thomas R Roast , Martin Cubitt, J Michael Roberts, Neil M Thomas, Richard P J Carter, Maureen P Cubitt, Barbara L Caffyn, Joanna K Dorling, Nikki R Thomas, Gillian H Knox. 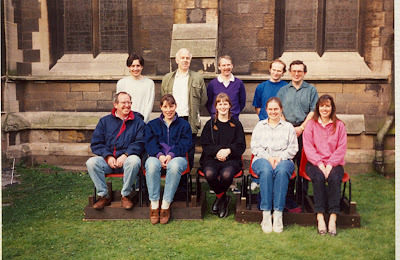 Gail K Baggott, Rachel D Carter, Zoe A P Rook, Joanne E Marshall, William N L Clubb, Matthew Lawrence, Philip J Day, Martyn G Reed, Andrew C Ogden, David J Bateman. Gordon Halls receiving the cup.